In fantastic movies describing the future, the urban transport almost always moves by air, where there are no traffic jams or bad roads. It seems the time when such a scenario will be implemented gradually approaching. The first aircraft for private use available to potential buyers is created in Germany by experts of the European Space Agency. 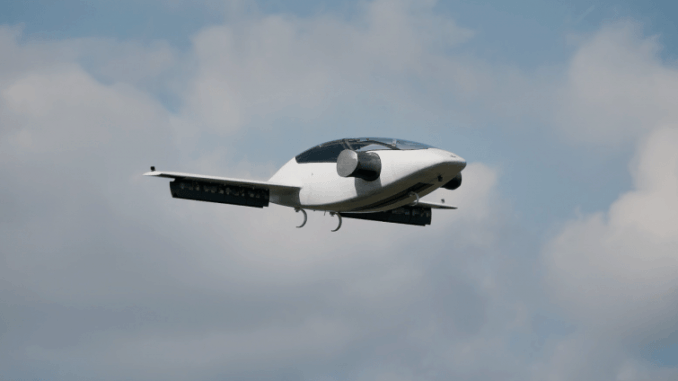 The car has received the name Lilium Jet and is a miniature two-seated aircraft, which combines the capabilities of vertical take-off/landing with the usual horizontal flying in the air. The novelty is able to accelerate to the speed of 400km/h and must rise into the air for the first time until the end of this year or in the 2018 year. It is reported that the model can be controlled in three modes. The first mode means the regular human management from the cockpit. The second mode means the human management using the remote control panel from the ground. The third mode means usage of the autopilot. In the process of the aircraft development, the engineers paid significant attention to the issues of noise. The conducted calculations showed that electric motor will provide a sufficiently high level of acoustic comfort in the cockpit. The developers note that Lilium Jet delivers minimal noise among all the developments within the DARPA X-plane project. The engine power is 435 horsepower, and it is fed by the batteries. Today Lilium Jet refers to the sports aircraft class. Such classification provides the availability of the development for massive usage. For example, it is enough to pass short-term courses with only 20 hours of training to obtain a license for flying. It is planned that initially special runway and landing siteswill be built for Lilium Jet. Later on, when theaircraft’s reliability level increases, any open area not less than 15×15 meters will be used for Lilium Jet landing. The most economical mode of flight involves the flying at 300km/h speed. In this case, the aircraft covers up to 500 kilometers using one-charge battery capacity. When flying at higher speeds the battery capacity will be enough to cover 250-350 kilometers, depending on the situation. The developers note that their aim is to create a vehicle for people suitable for everyday use. The use of vertical takeoff/landing allows simplifying the infrastructure requirements; in particular, to escape building mini airfields in favor of any unequipped flat areas of small size. The project’sauthors say that the idea of flying aircrafts’ mass usage may seem a threat to traditional road transport, but it is not so. In recent years, theintelligent control systems’ development allowselectronics to control cars and aircraft independently and with high reliability. In result, machines like Lilium Jet will be even safer than helicopters. The use of automation will allow using it during the take-off and landing (the most complex activities), to exclude human error possibility. In addition, the electronics will prevent a pilot performing in-flight maneuvers with critical modes access. Today, the manufacturer plans to organize the first test-flight of Lilium Jet with a human in the cockpit during the fourth quarter of this year. The full test cycle should be completed in 2018.Its results must influence the final design and construction. This will start the procedure of the aircraft’s licensing and obtaining permits for its driving.